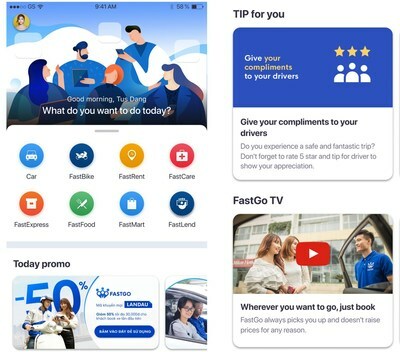 HANOI, Vietnam, March 20, 2019 /PRNewswire/ -- FastGo – Vietnamese car hailing application will launch in Singapore market in April 2019. This is the third country, in which FastGo is going to officially operate its service after Vietnam and Myanmar. According to FastGo's announced plan, FastGo application is going to be available in 6 Southeast Asian countries in 2019 including Vietnam, Myanmar, Singapore, Indonesia, Thailand, and Philippines. In June 2018, FastGo launched ride-hailing service in Vietnam after Uber withdrew from Southeast Asian market. FastGo is currently one of the top-2 ride-hailing applications in Vietnam with nearly 60,000 driver partners in 10 provinces and cities. In December 2018, with the cooperation with Asia Sun Group, FastGo launched its application in Yangon, Myanmar. FastGo is a member of NextTech Group (nexttech.asia), which is the leader in the Internet field in Vietnamese of E-commerce, payment and logistic. The main services of FastGo are three types of ride-hailing service, which are FastCar, FastTaxi and FastBike. The company is preparing to launch FastExress, FastCare and FastLend services as well. In August 2018, FastGo received a Series A investment from VinaCapital Ventures. The company is mobilizing Series B investments to expand its market. Being different from the other competitors in the market, FastGo does not collect a commission fee from the driver-partners. The company only charges a fixed amount of daily fee (daily subscription fee). In Singapore market, FastGo expects to charge an amount lower than 5 USD if the driver's income is over 30 USD per day. If the driver's income is lower than 30 USD per day, FastGo will not charge any service fee. Besides, there is no surcharge during peak hours. However, the application allows the customers to use the TIP (bonus) function when booking a ride, or choose the Priority services. This strategy helps FastGo swiftly attract the driver-partners and customers at a low cost. Mr.Nguyen Huu Tuat, Founder & Chairman FastGo shared, "Despite of being a follower, FastGo's model brings the best economic benefit to the drivers and customers. Any FastGo ride will always be cheaper than the others. The customers' safety is ensured with FastGo insurance package and they are served wholeheartedly by the drivers. Every city, where FastGo presents, the driver-partners support and promote FastGo enthusiastically to the passengers. Hence, we are able to save the marketing cost to reach new customers. Our resources will be saved to invest in improving products and the service quality, in order to increase the benefits for the users and driver-partners." Since Apr 1 2019, FastGo will officially open the registration for the driver-partners in Singapore. The application will be available for customers to book a ride from April 30, 2019. After Singapore, the next city that FastGo will start its adventure is Jakarta, Indonesia.